Walking with Jesus: Day 27: Acts 9:10-19a & Prov. 12:1-9 - Does Faithful Ministry Always Involve Suffering? Day 27: Acts 9:10-19a & Prov. 12:1-9 - Does Faithful Ministry Always Involve Suffering? 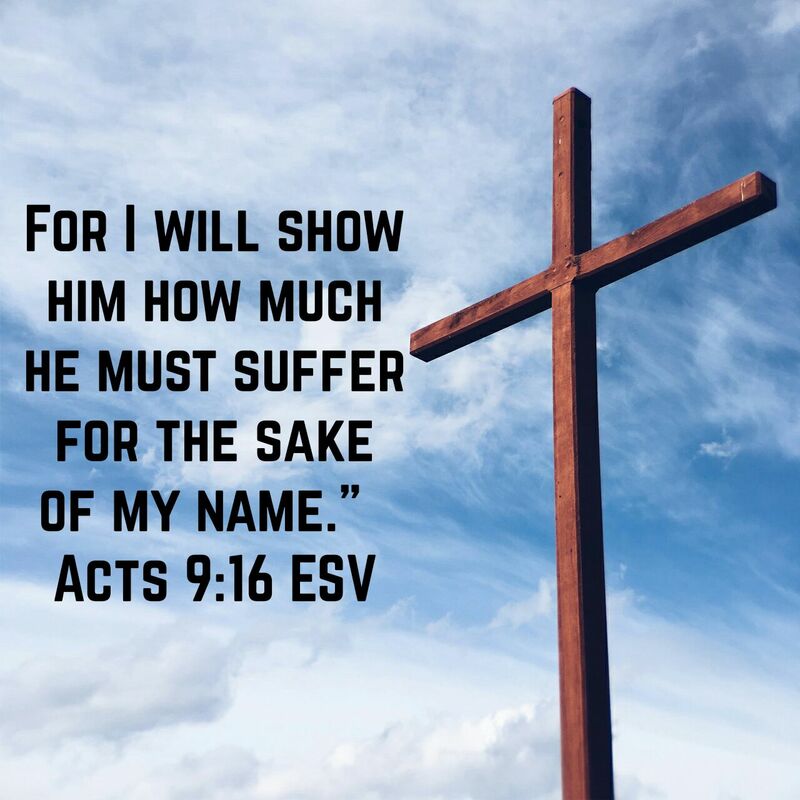 Does Faithful Ministry Always Involve Suffering? Ananias was afraid, and he had good reason to be. Saul had earned a vicious reputation among the Christians as a determined and ruthless opponent. Now he had come into Damascus, and Ananias didn't know what to expect. Rumors were probably circulating, fueling wild speculation. So when Jesus came to Ananias in a vision and told him to go and find Saul of Tarsus, he was very anxious. The words Jesus used to reassure Ananias were interesting. Jesus didn't say, "Oh, you don't have any reason to be anxious, Ananias. Saul is a Christian now." No, instead Jesus referred to Saul as "a chosen instrument of mine to carry my name." The emphasis is not on how Saul has come to faith in Jesus, but on how Jesus has chosen Saul to be His own instrument, His own apostle. Then Jesus says something very startling. This man, Saul, who had been the source of such suffering for God's people, will himself suffer much for the sake of the name of Jesus. This may prompt a question: Do all of Christ's chosen instruments, who carry His name to the world, suffer for the sake of that name? Saul himself would certainly suffer. As the Apostle Paul, he would recount his sufferings years later: "Five times I received at the hands of the Jews the forty lashes less one. Three times I was beaten with rods. Once I was stoned. Three times I was shipwrecked; a night and a day I was adrift at sea . . ." (2 Cor. 11:24-25) The experiences of the other apostles of the Lord were not much different. Peter would end his life crucified upside-down for the name of Jesus. James would be run through with a sword. Andrew would be crucified on a cross shaped like an X. Thomas would travel all the way to India, where he would be killed for the sake of Jesus' name. Of course, not everyone is called to suffer the way the apostles did. But we must never forget that we serve a crucified Savior who calls all of His disciples to take up their cross daily and follow Him. We cannot ever take His name to the world without opposition, rejection, heartache, loss and pain. Christianity is always faithfully advanced in the shadow of the cross. Lord, give us willing hearts to follow Jesus, whatever it may cost. Give us loving hearts to carry His name, no matter what suffering that name may bring. May we embrace the suffering and so enter into Your glory. Just as Paul took food and was strengthened before he entered into ministry, so let us feast on Your word and be strengthened by Your Spirit to minister to others in Your name. In Jesus' name we pray, Amen. that we may love even Your rebuke as You teach us wisdom. and give us sincere hearts for Your good. but You have grounded us in Jesus, our rightousness and our wisdom. Because of Jesus, we trust that we will never be moved. Father, thank You for good spouses, who love You and help us love You. Give us the grace to bless our spouses in Your name. and then they shall be righteous and just, as You are. but the mouth of the upright delivers them. and may we speak what You give us to say. Father, by Your saving grace alone we stand. so teach us and lead us according to Your own wisdom and not our foolishness. but always be willing to serve and love those in need.